I had never heard of Meyer lemons until we moved to this area. It seems every street has at least one Meyer lemon tree growing in someone’s yard. It’s a really great thing! Meyer lemons are larger than regular lemons, have thinner skin, a sweeter flavor, and more juice than regular lemons. This makes them perfect for so many recipes. 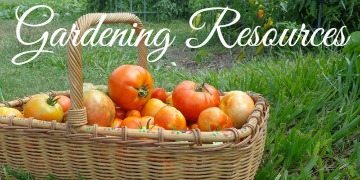 In honor of our upcoming citrus harvest I’ve collected the best Meyer lemon recipes to share with you. Meyer lemons are thought a cross between a regular lemon and a mandarin orange. They originated in China and were brought to the US in the early 1900s by Frank Meyer, hence the name. 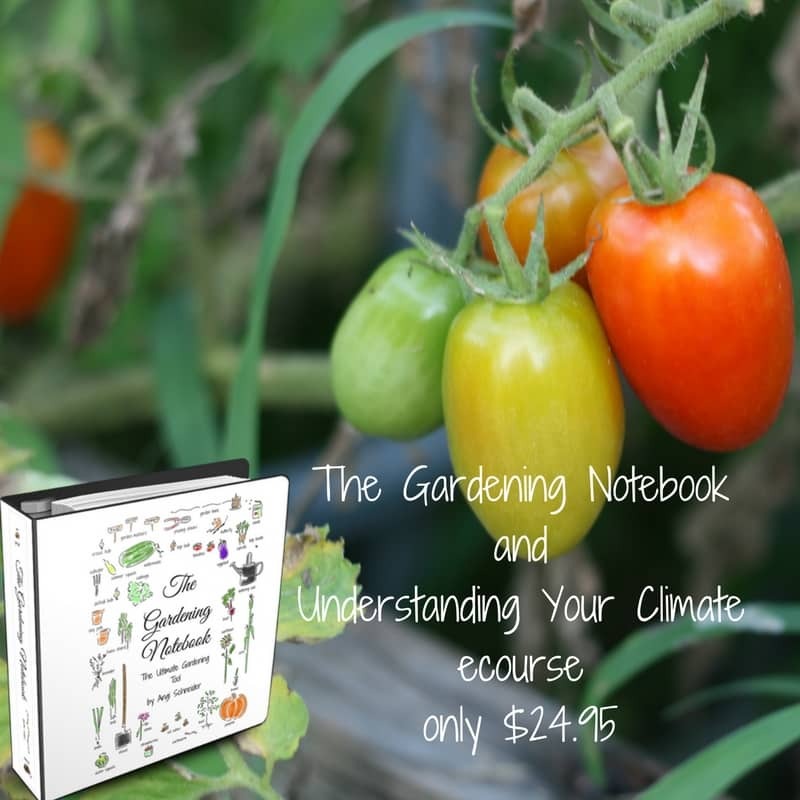 As they ripen they will get more orange inside and out and will often be confused with a sour orange. But Meyer lemons have the distinct lemon flavor – not just a sour flavor. The thinner skin means that there’s less of the bitter white pith, which means the whole lemon can be used in some recipes. If you’re going to use the whole lemon, make sure to use organic Meyer lemons. Most citrus sold in stores is sprayed with a fungicide to keep them from mildewing but organic ones won’t be sprayed. 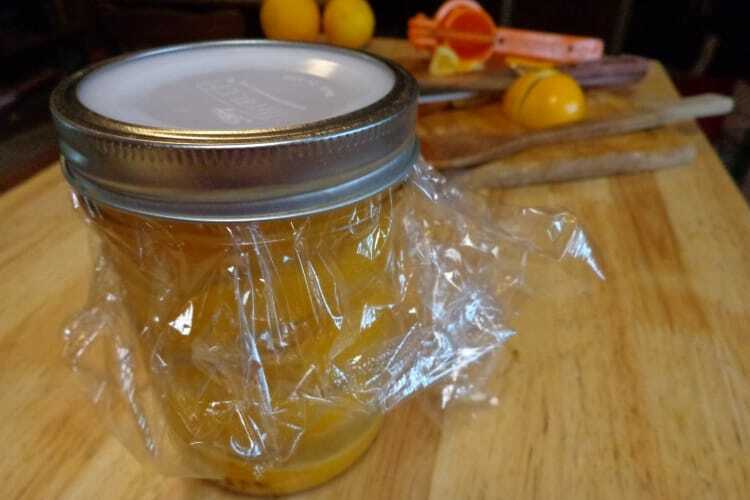 Meyer lemons are more expensive than regular lemons so either use them quickly, put them in the refrigerator, or preserve them so they don’t go bad. Bundt cakes are so great because they’re attractive but so very simple to make. This Meyer lemon bundt cake is topped with a lemon icing that includes lemon zest which makes it extra interesting. Pound cakes fall into the same category, simple but so very good. 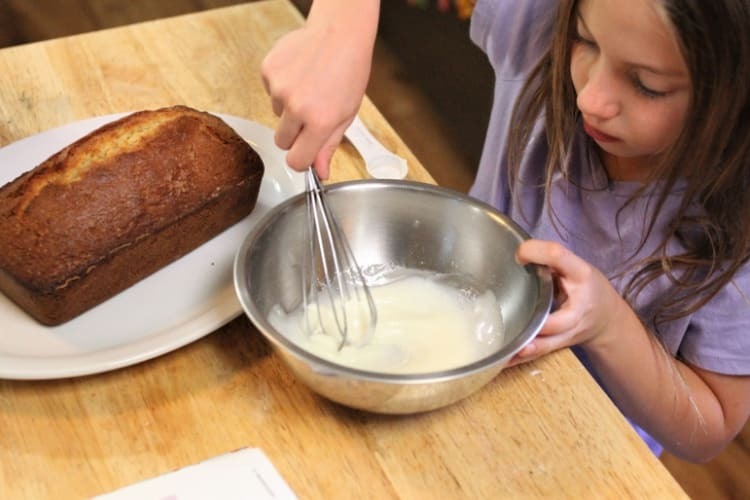 Meyer lemon loaf cake is so simple that a child can make it with just a bit of help from a big person. Lemon cookies are such a wonderful treat. The lemon adds a bit of tartness to a traditionally sweet dessert. Try these lemon crinkle cookies or these Meyer lemon iced shortbread cookies. If you need gluten free cookies try some lemon coconut oatmeal cookies. Or how about a more savory cookie? These Meyer lemon rosemary shortbread cookies are pretty wonderful. 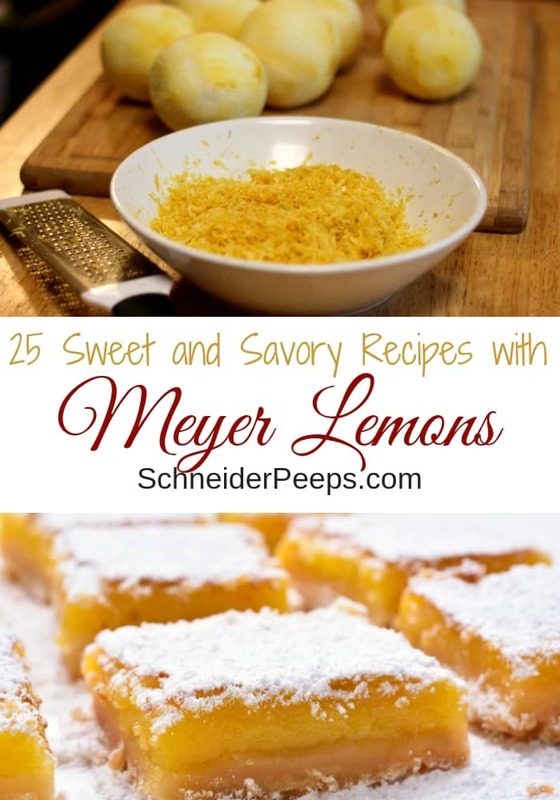 Can I confess that I have an obsession with Meyer lemon bars? To the point that I don’t EVER make them, if they’re in the house, I will certainly eat them until every last one is gone. But if you bring them to a pot luck, I’ll be super excited and it will probably be the only dessert I eat – I won’t eat the whole pan though because I’m in public. If you’re serving individual desserts, Meyer lemon cream brulee would be fantastic. I’m not sure I could make enough Meyer lemon filled chocolates to actually give some away as gifts. Could you – or would you be tempted to eat them all? Who knew you could make Meyer lemon ice cream? It’s a good thing we have really mild winters so we don’t have to wait until summer to make ice cream. Limoncello is traditionally used as a before dinner drink to get the digestive juices flowing before actually eating. It’s easy to make and can really make a difference if you’re eating a heavy or hard to digest meal. If you regularly have digestive issues or don’t drink alcohol bubbly probotic lemonade is the drink for you. If you enjoy herbal tea try lemon mint tea before bed for restful sleep. Every year we forage dewberries (wild blackberries) and freeze enough to last the year. I think I’ll try this Meyer lemon blueberry soda recipe with dewberries – since I stink at growing blueberries. While we have an influx of lemons in the fall, our tree can easily give us 300 pounds of lemon each season, I preserve them so we can use them all year long. I freeze the juice, slices, and some whole. I dehydrate the zest and make lemon salt and lemon pepper. I make fermented lemons, also called preserved lemons. I also make Meyer lemon marmalade and Meyer lemon curd for the freezer. There’s something wonderful about the combination of lemon and lavender, don’t you think? Preserve the refreshing combination in a Meyer lemon lavender jelly. Meyer lemons can also be fermented in a brine with lavender for Preserved Lavender Meyer Lemons. One of the most important things I do when we get our first lemons is put about a dozen in a ziplock bag and toss it in the freezer. This way I know for certain that I will have organic lemons for medicine making all year should I need them. 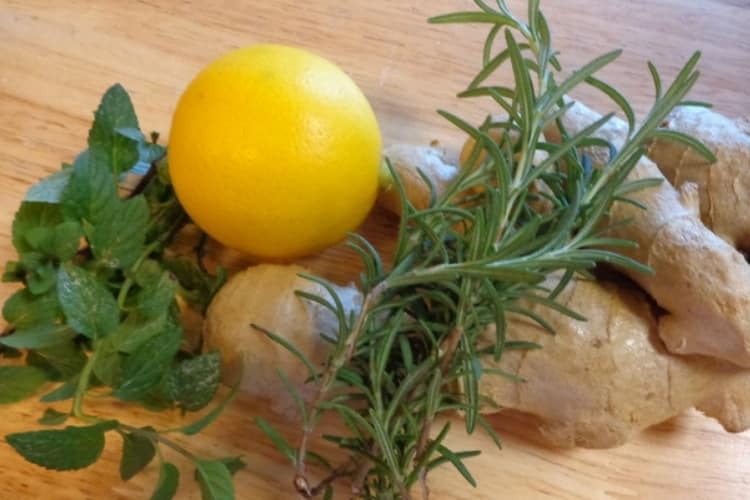 I have a short course on making homemade cold and flu remedies that really work available. You can get more information by clicking here. A squirt of lemon brightens almost any dish, so don’t be afraid to squirt some Meyer lemon juice in your green beans or on your meat when cooking. You could even make Meyer lemon butter sauce and just drizzle it on foods here and there. Meyer lemon juice is also great pasta – but not just any pasta, how about a zesty Meyer lemon linguine with asparagus or Meyer lemon spaghetti with thyme. I realize most people are watching their carb intake but sometimes you just need a bread to go with that pasta – such as a Meyer lemon rosemary focaccia. What is a salad without dressing? But most store bought dressings are full of “stuff” or super expensive. 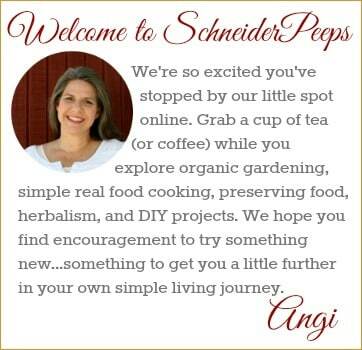 Instead try some Meyer lemon salad dressing. Or how about some slow cooker Meyer lemon chutney? It pairs really well with Indian food but I also hear it’s great just eating it right out of the jar. 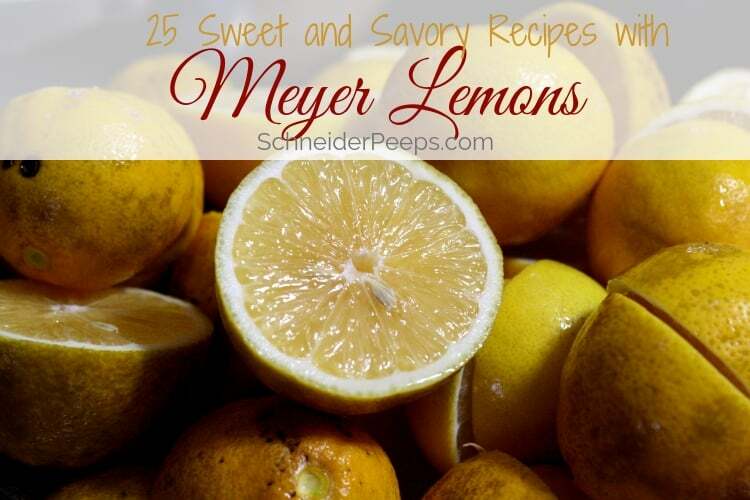 So, tell me what is your favorite recipe with Meyer lemons? Feel free to leave it in the comments for us all to enjoy! I bought several bags of Meyer lemons on markdown last year (I am in OH, they don’t grow locally here unless you have a good greenhouse or sunroom to overwinter them). They were too soft to slice to dehydrate, so I quartered them and froze them. I add them to my water glass daily, and use them for cooking all the time, mostly with poultry. I am not much of a baker, but some of those recipes sound yummy! What a great score. As they ripen their skin tends to get even thinner and they get more juicy which makes them hard to slice. I’m glad you were able to freeze them and enjoy them all year long.